The Department of Neurosurgery led by Professor Christian Raftopoulos regularly performs all neurosurgical procedures, the majority of them using full Neuronavigation. The main operating theatre is equipped with the most up-to-date systems, in particular a brand new intraoperative high-resolution MRI (3.0 Tesla). This system allows the neurosurgeon to check the progress of the surgery safely throughout the procedure. Saint-Luc acquired high-resolution 3.0-Tesla Magnetic Resonance Imaging equipment for its operating theatre in January 2006. This equipment is unique worldwide and has proven to be a valuable asset in procedures performed by Professor Raftopoulos and his neurosurgical team. Since 2010, the service has used 3D robotic intraoperative system to check pedicle screw insertion to increase patient security. The use of this kind of imaging robot for spinal surgery was a european first. Christian Raftopoulos, MD, PhD, has headed-up the Department of Neurosurgery at the Cliniques Universitaires Saint-Luc since 1996. During this time, the Department has expanded rapidly: in 1998 he performed the world's first implantation of an electrode around an optic nerve on a blind patient and has also become an international authority on brain and vascular surgery (intracranial aneurysms). He is regularly invited abroad for conferences. He was General Secretary of the French Speaking Society of Neurosurgery for six years. He has a well-established Surgical Planning Laboratory with the most recent techniques of visualisation. 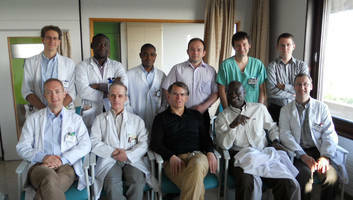 Standing: Dr P. Finet (MACCS), Dr M. Lawson (MACCS), Dr G. Ntsambi (DACCS), Dr E. Astarsi (MACCS), Dr C. Ciobanu (MACCS), Dr Waterkeyn (MACS).